The East Coast of the United States is filled with gorgeous sights to see. From the glistening, crashing waves of the Atlantic Ocean to the vast and many mountain ranges overlapping into several states, the views never disappoint. However, the team at MyDriverLicenses.org understands that there are, in fact, different strokes for different folks. So, while one traveling group’s ideal road trip might include daily hikes and rugged trails, another might prefer the best restaurants and musical venues, instead. 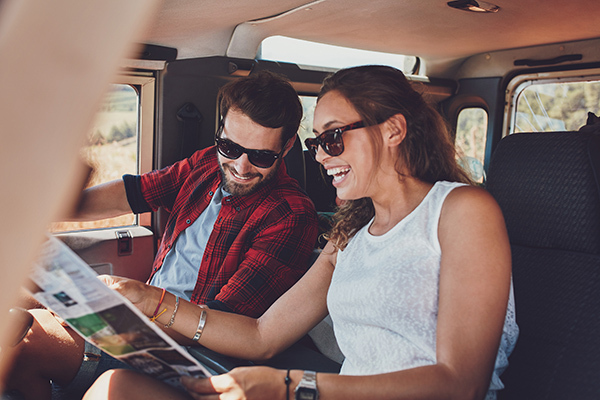 Whatever road trip you fancy, the MyDriverLicenses.org experts have developed a general outline of tips – including a plethora of notable destinations – so you can plan an East Coast road trip that is truly your style. Refer to the below tips, so you can get to packing your cooler and scooping up your posse, so that you can hit the road. According to the team at MyDriverLicenses.org, the very first step you must take when planning an East Coast road trip is to select your departure and return dates. Keep in mind that many road trippers often opt for summer excursions to avoid winter weather and low temperatures. Besides, you can’t very well jam out to your favorite tunes with the windows down while your teeth chatter and snowflakes blast your face. In addition, summertime is popular if you are employed by a profession that has lax summer hours or summer months off. So, start by choosing the length of your road trip – be it a week or a month – and then, pinpoint your dates. If you have the freedom to do so, you can be flexible with your dates, and allow for extra, impromptu stops along the way. This step might prove to be difficult for some, especially if you are unfamiliar with the states blanketing the East Coast. The MyDriverLicenses.org experts recommend taking a look at a U.S. map to choose the states along the actual coastline, to start. If you want to visit certain neighboring states as well, you can definitely design your route to incorporate a few of the non-coastal U.S. states. Once you choose the states you want to visit, you can get to selecting the landmarks and sites that interest you most. Florida: Key West, South Beach, Walt Disney World and Universal Studios theme parks, Everglades National Park, Busch Gardens, SeaWorld and St. Augustine. Georgia: Downtown Atlanta, World of Coca-Cola, Jekyll Island, Chattahoochee National Forest and Callaway Gardens. North Carolina: Asheville, Biltmore Estate, Blue Ridge Parkway and Blue Ridge Mountains, Chimney Rock State Park, NASCAR Hall of Fame and Old Cardinal Gem Mine. Virginia and Washington DC: Colonial Williamsburg, Virginia Beach, Shenandoah National Park and Skyline Drive, Arlington National Cemetery, the White House, the Lincoln Memorial, Smithsonian National Air and Space Museum, Smithsonian National Museum of Natural History, United States Holocaust Memorial Museum and the National Mall. Tennessee: Graceland, Dollywood, The Great Smoky Mountains National Park, Country Music Hall of Fame, Grand Ole Opry, Jack Daniels Distillery, Downtown Knoxville and Lookout Mountain. Pennsylvania: Independence National Park and the Liberty Bell (followed by Philly cheesesteaks), Hershey Park, Gettysburg National Military Park, Andy Warhol Museum, Valley Forge and Pennsylvania Dutch country. New Jersey: Jersey Shore, Atlantic City and Boardwalk, Cape May, Grounds for Sculpture, the Adventure Aquarium and High Point State Park. New York State and New York City: Niagara Falls, Lake Placid, Finger Lakes, Letchworth State Park, Watkins Glen State Park, the Adirondacks, Statue of Liberty, Times Square, Metropolitan Museum of Art, Empire State Building, shopping on Fifth Avenue, Central Park, shows on Broadway, Brooklyn Bridge, New York City dining and Yankees baseball games. Massachusetts: Freedom Trail, Faneuil Hall, Minute Man National Historical Park and Lexington Green, Cape Cod Beaches, Plimoth Plantation and Mayflower II, Norman Rockwell Museum, whale watching at Stellwagen Bank National Marine Sanctuary and Martha’s Vineyard. Vermont: Ben & Jerry’s, Stowe, Lake Champlain, Brattleboro Farmers Market, Quechee Gorge, Great Mountain National Forest and Rock of Ages Quarry and Hope Cemetery. New Hampshire: Clark’s Trading Post, Cannon Mountain Aerial Tramway and Franconia Notch, Portsmouth Harbor Trail, Mount Monadnock, Hampton Beach, Fuller’s Sugarhouse for maple products and gifts, Lake Winnipesaukee, Story Land, Lost River Gorge and Mt. Washington Cog Railway. Maine: Kennebunkport, white water rafting on the Kennebec River, Acadia National Park, Boothbay Harbor (followed by lobster rolls) and Mohegan Island. Once you have gone through and highlighted the standout sights and attractions that you want to experience, or see, you can begin crafting your itinerary. The experts at MyDriverLicenses.org recommend including roadways, freeways and highways on your route, along with lodging information (try to book campgrounds, hotels, bed and breakfasts and AirBnBs). In addition, pencil in gas stations and rest stops, as well as notable restaurants at which you would like to dine. Once you finalize all the little details, it will be time to hit the road for your exciting East Coast adventure!